Many people shy away from growing amaryllis for the holidays, concerned that these are too finicky and once the bloom is over, the bulb is tossed on top of the compost pile. But amaryllis are easy to grow and can be enjoyed for years in your home or garden. Bulbs purchased and potted now will bloom in three to six weeks. The amaryllis bulbs you buy this time of the year have been prepped to bloom in winter by being kept dry and cool for a specific length of time. Before buying, make sure the bulb is firm and doesn’t have cuts or bruises. Size matters: larger bulbs will have larger flowers with more stalks. To get the bulb started, place it in a 6-inch container using a good quality soil-less potting mix. Amaryllis bulbs like a snug pot, so don’t plant them in something too large. The bulb needs only an inch of space around the widest part of the bulb. Make sure the pot has drainage holes as amaryllis don’t like wet soil. Place the bulb inside the pot so the top 1/3 of the bulb is above the top of the soil and the pot edge. Water the plant well after potting, but not directly on the bulb, and then only when the soil is dry. If you use a dish under the container, don’t let water accumulate in it; empty the dish after each watering. Place the pot in a warm, sunny area, and in about 3 to 6 weeks you’ll have a gorgeous amaryllis bouquet. Once the flowers appear, move the container to a cooler location away from the sun to help the flowers last longer. You should rotate the pot each day to help the flower spike stay straight. After the plant blooms and the flowers fade, cut the stalk back to where it emerged from the leaves. From here you have two options. Keep the pot in a warm area of 70-75 degrees for about 9 to 10 months. Fertilize the bulb once a week with a liquid fertilizer or use slow release pellets applied on the top of the potting soil. Lightly water it about once a week. Then here’s the catch, 8 to 10 weeks before you want to start the bloom process, place it in a cool temperature of about 55 degrees. It needs this chill factor to bloom again. After this, put it back in a warm sunny area and in 3 to 6 weeks you will have flowers once again. Amaryllis are hardy in the Triangle zone 8, so you can plant these outside in the spring to enjoy for years to come. Plant the bulb(s) outdoors around the middle of April after the threat of frost in a sunny to part sun location that has well-drained soil. Plant these in the same manner as you do in containers – with the top 1/3 of the bulb sticking up above soil level. Add mulch around the bulb, but don’t cover the top. Now the amaryllis will bloom in the spring instead of during the holidays. Amaryllis are deer and vole resistant. While it’s tempting to grow a traditional red or white amaryllis, step out of your comfort zone and look for unusual varieties like these. ‘Gervase’ – This beauty has red stripes on bright to light pink petals. The individual flowers are variably colored; each one looks a little different. ‘Papilio’ – Latin for butterfly, ‘Papilio’ has striking blooms of maroon, bronze, and cream. 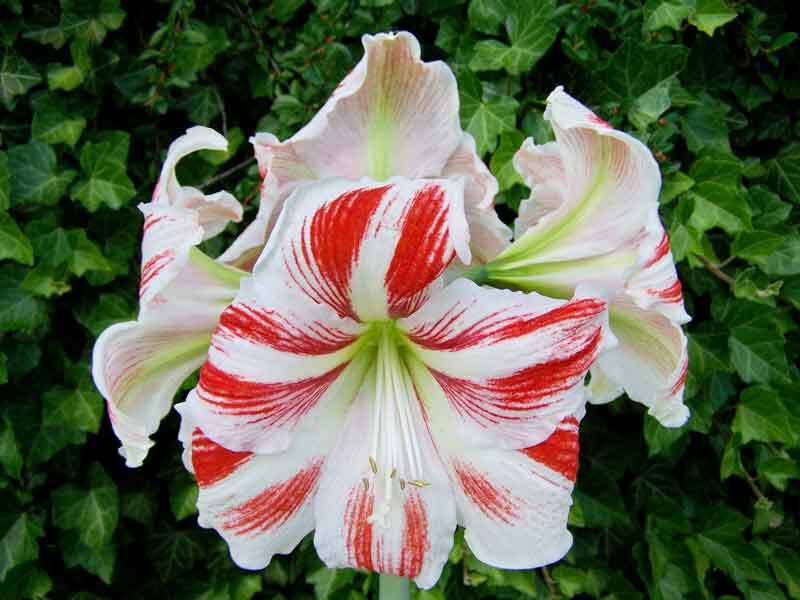 This rare amaryllis is slow-growing and evergreen, producing 2-3 dramatic blooms per stem. The bulb may not bloom the first growing season, but it will multiply in the pot and bloom the following winter. ‘Exotic Peacock’ – This colorful variety has double red flowers with white stripes. Its fragrant flowers measure 8-10-inches across and each bulb produces 1-2 stems, with at least 4 flowers. Sources: NC State Extension, High-Country Gardens.